Loyal Let’s Talk Hook Up fans need not panic when they find 1090AM down this weekend. The show goes on! Due to some issues with broadcast issues, the show radio station will not be active, but as always, the show will continue on the live stream from the website and on the Let’s Talk Hook Up app. 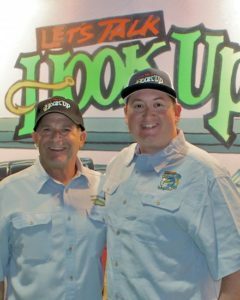 “Let’s Talk HookUp” covers freshwater and saltwater fishing in Southern California and Baja. From fly fishing for trophy rainbow trout to saltwater fishing for 400-pound tuna, “Let’s Talk HookUp” is formatted to excite all Southern California anglers. Every show contains reports and special expert guests from various regions. The show features live reports from Baja, call-ins from on-the-water skippers, as well as a private boater report and current news from local landings. A different expert guest joins host Pete Gray and co-host Rick Maxa on the show each week. Cory Sanden from MC Swimbaits has joined the show as our third co-host and will be there when Pete or Rick are traveling. Guests include fishing boat owners/skippers, fly fishing guides, tackle experts, resort operators, and top anglers from all over the West. Listeners are able to speak with these experts on the air via 877-792-1090 or 858-457-1090. All callers are eligible for special prize drawings.